We all know that breed characteristics were selected for the breed’s intended work: greyhounds were bred to hunt by sight, bassets and beagles to hunt by scent, retrievers to retrieve and swim, terriers to rout out the hiding places of small game. Breed mixes carry the inherited traits of each of the breeds, to a greater or lesser degree. But nowadays it’s rare that we ask our house dogs to do the work for which they were intended, even as those traits still surface, often to our dismay. The trick is to tap into those natural traits of your dog, channeling them in positive, creative games and tasks, while discouraging some of the more troublesome aspects of their behaviors. Ultimately, you know your dog and you know his strengths… so let’s use them to best advantage, for your dog’s well-being as well as your own. This is a game of sniffing out a fragrant piece of food and it makes a wonderful pastime, particularly for a scent-driven dog. First we must install the command. We want Go find it! to indicate that there is food somewhere for the hunting. Start easy by saying “Go find it!” and tossing a piece of kibble. Make it easy to find. As she gains fluency, make the treat increasingly well hidden, under furniture, in her crate, inside a toy on the floor, wherever… be creative! And you can hide a couple of treats at one time; when she’s found the first, repeat the command “go find it” to indicate that there’s still another one out there somewhere. Note: Do not hide the tidbits in places where you don’t want her hunting, like on a table top, which would encourage counter surfing. Also, if your dog breaks her stay, put her back in her spot. What she’ll learn is that breaking her stay delays the game. Far from being adversarial, your dog considers playing tug with you to be cooperative… together, you are subduing the “prey”. Playing tug can also accentuate the herding instinct while at the same time making the drop it an important component of the exercise (i.e. a working dog would have to release the stray sheep on command). To start, you must teach your pup to “drop it” and “take it.” When your pup has a toy in her mouth, say “drop it” and offer a tasty treat right at her nose. 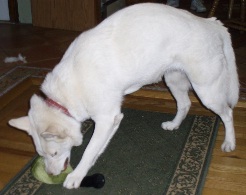 Then offer her toy back to her with a “take it.” This way, drop it doesn’t mean to her that she’s losing her toy permanently but just long enough to get a nice treat and then get the toy back. Now say “tug it!” and offer her the other end of the tug rope. Play a vigorous bout of tug, then have your arm become motionless (i.e. the prey goes limp), and say “drop it.” By now, she should be dropping without treat; instead the reward is getting the opportunity to play tug again. To increase impulse control, show her the tug toy and use a command like wait or simply wait for her to show polite behavior, like a sit or down. She should only grab hold of the tug toy when invited with a tug it! Playing is on your terms: you start the game and you end it. Ignore her if she tries to provoke more play. If you notice undesirable behaviors developing, like body checking or mouthiness, give a verbal warning like “uh uh” to mark the behavior you don’t like and ask for a “sit” to quiet things down a bit. If the behavior continues with more play, say “Too bad!” and stop the game. Always quit with your dog wanting more.